Stripe Painted Water Lily Tee is rated 4.9 out of 5 by 12. 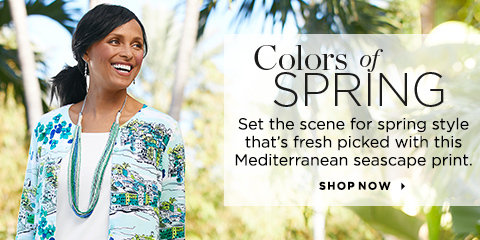 Knit stripes add an extra pop of pizzazz to this v-neck tee's pretty watercolor lily pattern. Plus, silky-soft fabric makes it seriously comfy, so it's bound to become a favorite. Rated 5 out of 5 by Melissa Sue from Super comfy. Goes perfect with seagoam green pants or my jeans. It even has the design on the back! Great find. Rated 5 out of 5 by Charlie66 from I love this top! I like the fit and the color.i will shop C and B again. Rated 5 out of 5 by gwen26 from love this top, wear it often This top goes with just about anything from jeans, to dressy pants to skirts. Love the color combination and feels light and cool even with 3/4 sleeves. Rated 5 out of 5 by Bcm54 from Love it Purchased a couple weeks ago. So comfortable not tight at waist. Long enough to cover hips. Just beautiful, can't say enough good things about this top.